[Alexandria, VA] – New data released by the Washington Traffic Safety Commission indicate several troubling trends have emerged since marijuana legalization. Marijuana-impaired driving fatalities have more than doubled (13 in 2012 to 27 in 2016). One in five drivers are under the influence of marijuana. That is up from one in 10 prior to legalization. 64.2% of respondents who reported using marijuana and driving stated they didn’t think it impaired their ability to drive at all. The report also found that almost 17% of marijuana users admitted to using the substance every day. More than half of 15-20-year-olds reported they think marijuana use helps them drive. As a state that prides itself on having the “tightest” marijuana regime, these latest Washington State numbers demonstrate commercialization of pot has created significantly more dangerous roads and problematic alcohol use. The most common drug combination found among poly-drug toxicology reports in these fatalities was alcohol and marijuana. This flies in the face of pot lobbyist claims that marijuana legalization would drive down alcohol use. 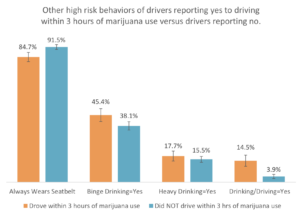 In addition, this survey found that drivers who admit to driving within three hours of using marijuana are also more likely to drink and drive, not wear a seat belt, and binge drink.